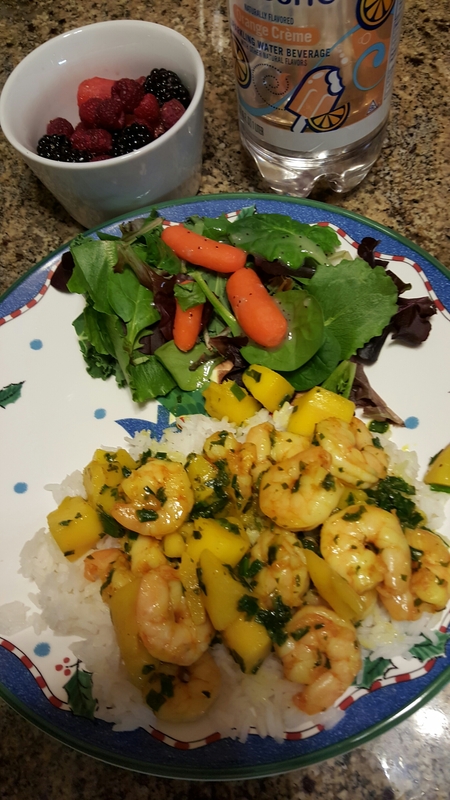 Toss shrimp with salt, cayenne to taste and turmeric in a medium bowl. Cover; refrigerate for about 30 minutes. Heat oil in a large nonstick skillet over medium-high heat; place the shrimp in a single layer and cook until the undersides turn salmon-pink, about 1 minute. Flip them over and cook for 1 minute more. Add mango, scallion greens and basil and cook, stirring, until the shrimp is just cooked and starts to barely curl, 1 to 2 minutes. 1. Slice both ends off the mango, revealing the long, slender seed inside. Set the fruit upright on a work surface and remove the skin with a sharp knife. the fruit from both sides of the seed, yielding two large pieces. 3. Turn the seed parallel to you and slice the two smaller pieces of fruit from each side. 4. Cut the fruit into the desired shape. 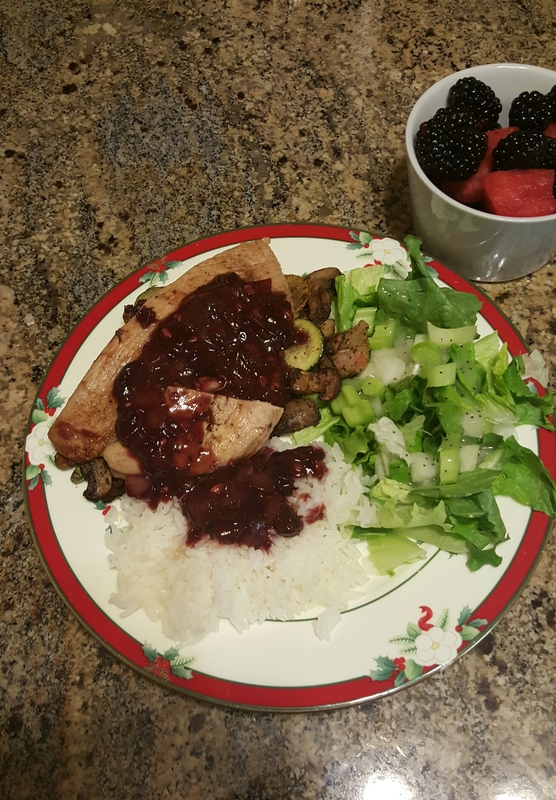 Tonight, I’m serving with rice, garden salad and fresh fruit compote. Heat 1 tablespoon oil in a large nonstick skillet over medium-high heat. Add or potato and cook, stirring occasionally, until browned, about 5 minutes. Add the remaining 1 tablespoon oil and chicken; cook, stirring occasionally, until no longer pink on the outside, about 4 minutes. Add sauce; adjust heat to maintain a gentle simmer, cover and cook until the potatoes are tender and the chicken is cooked through, 8 to 10 minutes. Stir in asparagus and simmer for 1 minute more. 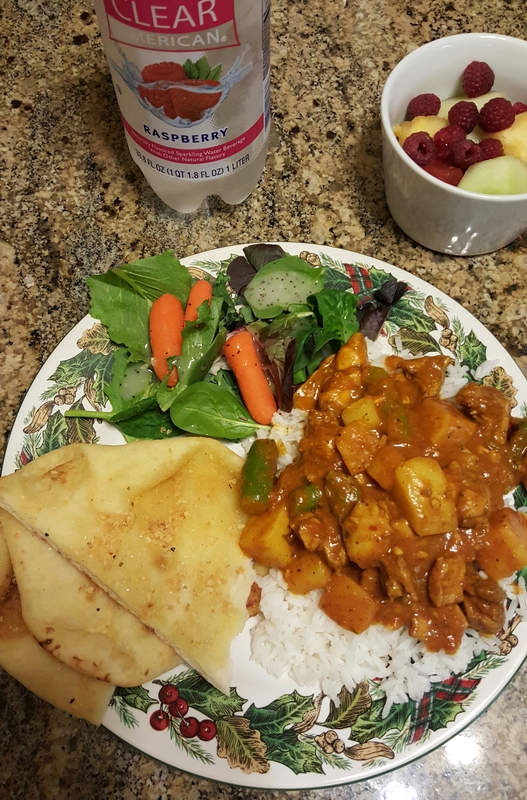 Tonight I am serving the Tikka Masala over Basmati rice, served with a side salad and fresh fruit compote. You can pull the meal together with a glass of Taj Mahal or Kingfisher Beer. Preheat oven to 175 degrees F (80 degrees C). Place a medium dish in the oven to warm. Heat a large skillet over medium-high heat. Brush chops lightly with oil and place in hot pan. Cook for 5 to 6 minutes, turning occasionally, or until done. Transfer to the warm dish, and keep warm in the preheated oven. In a small bowl, combine brown sugar, salt and pepper, cinnamon and nutmeg. Add butter to skillet, and stir in brown sugar mixture and apples. Cover and cook until apples are just tender. Remove apples with a slotted spoon and arrange on top of chops. Keep warm in the preheated oven. Continue cooking sauce uncovered in skillet, until thickened slightly. Spoon sauce over apples and chops. Sprinkle with pecans. Heat 2 teaspoons oil in a large ovenproof skillet over high heat. Season turkey with 1/4 teaspoon salt and pepper and cook until golden brown on one side, about 3 minutes. Turn it over and transfer the pan to the oven. Roast until the turkey is no longer pink in the middle and registers 165°F on an instant-read thermometer, 15 to 20 minutes. Transfer the turkey to a clean cutting board and tent with foil to keep warm. Heat the remaining 1 teaspoon oil in the pan over medium-high heat. (Be careful, the handle will still be hot.) Add onion and cook, stirring, until starting to soften, 2 to 3 minutes. Add garlic and cook, stirring, for 30 seconds. Add cherries, 3/4 cup cranberry juice, whiskey, thyme, mustard and the remaining 1/4 teaspoon salt. Cook, stirring occasionally and scraping up any browned bits, until reduced, about 4 minutes. Meanwhile, stir together the remaining 1/4 cup juice and cornstarch in a small bowl. Add to the pan and cook, stirring, until thickened, about 30 seconds. Slice the turkey and serve with the sauce. Tip: Check the label to avoid turkey tenderloin “enhanced” with a sodium solution. 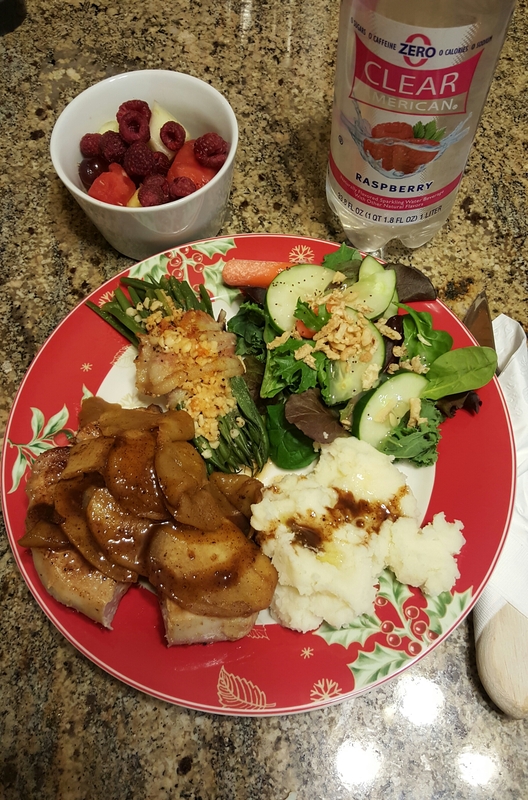 Tonight I’m serving, with rice, broccoli, garden salad, fresh fruit compote. Sprinkle pork chops with salt and pepper. Coat a large nonstick skillet with cooking spray and place over medium heat. Add the pork chops and cook until browned on both sides and cooked through, 2 to 3 minutes per side. Transfer to 2 serving plates; tent with foil to keep warm. Swirl oil into the pan, add shallot and cook, stirring, until soft, about 30 seconds. Add mushrooms and cook, stirring occasionally, until they soften and begin to brown, about 2 minutes. Add vermouth and cook for 15 seconds. Stir in mustard, thyme and any juices that have accumulated from the pork; cook until the sauce is thickened and slightly reduced, 1 to 2 minutes more. Spoon the sauce over the pork chops and serve immediately. 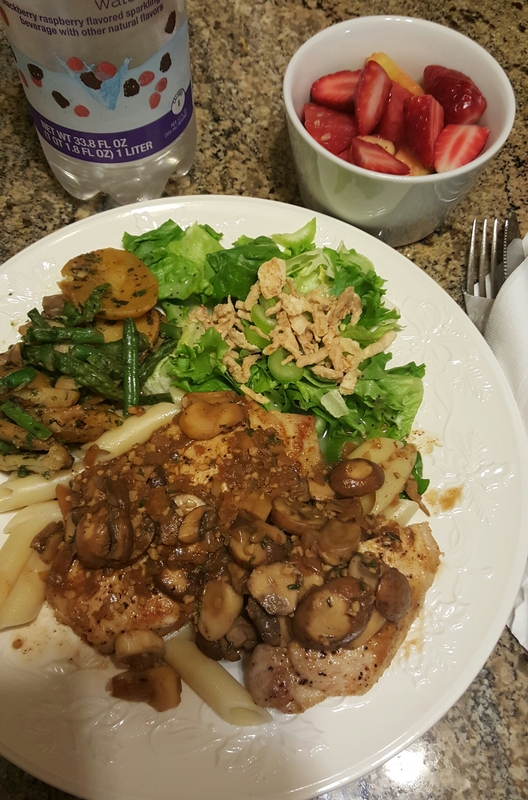 Tonight, I’m serving over a bed of pasta, green beans and carrots, garden salad and fresh fruit compote.